In previous blog posts, I’ve documented that cows are used to sell not only dairy products but also wine and beer. At the time I wrote those posts, I never thought I’d find another cow selling alcoholic beverages but today I did. Tonight we decided to go out for an impromptu dinner after my son’s karate lesson at our my favorite restaurant called Souplantation, where they have an abundance of soups, salads, pastas, muffins, fruit and desserts to choose from. Somehow this buffet is extremely popular every night of the week. Even though it shares a large parking lot with other businesses, parking spaces are a rarity at dinner time. So tonight we parked a little further down the shopping plaza, where we usually don’t. Now, I’m trying to understand why the bull would blow smoke? Is he just so pissed off because someone drank his beer? Or, did he think he was drinking beer but he happened to grab the hot sauce bottle instead? Or, since he’s in a bar, is he drinking beer and smoking cigarettes, blowing the smoke out of his nostrils? Previous Post Need some storage for your computer files? How about using a cow? I actually came up with the thought that he could have been sneezing…..but that’s pretty gross…..so eww! Haha, now that would be disgusting, but the cigarette smoke from the bar could cause the sneezing. Or… the bull drank the Coors Light without knowing it was light beer and spat it out where he realized it was, including through his nostrils… That would be gross too! Like many species, bulls fight by butting heads, snorting and pawing trying to beat up the smaller and weaker bulls. These behaviors are part of their natural mating habits. The “snorting” is actually feared, as it signals seriousness and generally stopping at nothing to get what they want. 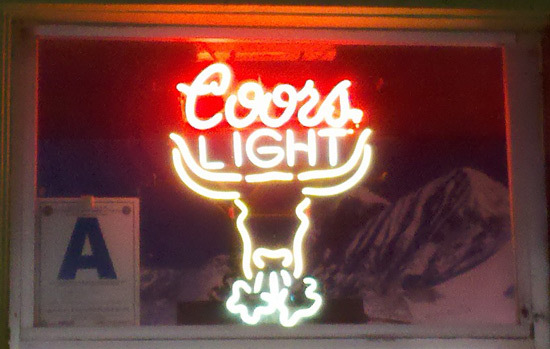 Coors Light is a big sponsor of many agricultural events, so this is generally understood. What I find is interesting is the subliminal message is that perhaps if you drink it, you are similar to the bull and can get the heifers and should be feared. It’s actually even funnier, especially since I’ve grown up in Colorado with Coors and around cattle all my life. If I were to walk in and actually see someone drinking it (which where I live, many people do), I would laugh out loud! It’s usually some guy watching his calories and not that that in itself is bad, just very funny! Now I want one of those signs – LOL! Whats funny too is a Longhorn is a small, lean type of cattle and that fits too! I guess Coors is trying to make its male drinkers masculine enough about drinking light beer. 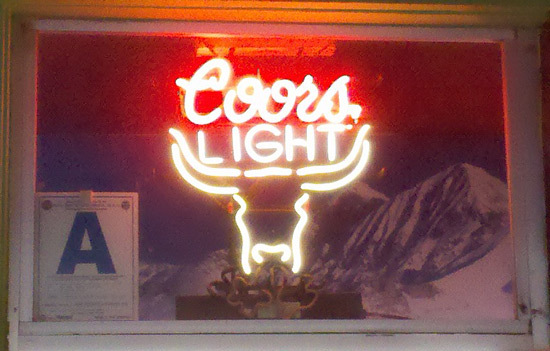 It won’t make them sissies and even turn them into bulls… You should look around if you can spot one of these neon signs. There has to be one where you live (Colorado).